July 4, 2013 July 5, 2013 Nefer Khepri, Ph. D.
Dispelling Wetiko: Breaking the Curse of Evil. Wetiko is a Native American term for “evil.” Paul Levy presents the concept of Wetiko for a modern western audience. The concept is discussed in both Jungian and Buddhist terms creating a unique approach to what has become endemic in the world today. Wetiko is basically another name for the Shadow, that side of ourselves we tend to hide, ignore, and attempt to stuff in a trunk and forget about it altogether. The problem is, the more we attempt to hide the Shadow the more it fights to get out into the light. The Shadow is but one aspect of Wetiko. Wetiko is true evil as it exists not only in the hearts and minds of humankind, but also outside of us, as another entity. Wetiko swoops in and can take over a person, causing them to do things they would not do under normal circumstances and left to their own devices. These days it is very unpopular to believe in the concept of evil, to realize that it exists, it’s real, and it affects everyone on our planet in a myriad of ways. Instead, people suffering badly from Wetiko and their loved ones are told it’s a mental disorder, here take these pills. They’ll make it all better. Or they will insist the person needs to be institutionalized in more severe cases of Wetiko in which the affected individual appears to be no longer capable of rational thought or behavior. Wetiko is insidious. It knows it can hide under this modern terminology of mental illness, so hide it does and very, very well. Even members of the Catholic Church, long the worldwide stalwart against evil, will insist a person is crazy first before they even begin to attempt to contemplate the idea that an individual may actually be afflicted by something much more sinister than mental illness. When I was growing up my own priest (I was raised Catholic, but am pagan now), once told me that the greatest trick the devil ever played on humanity was to convince us all that he and evil did not exist. He told me to never forget it’s merely a trick, no matter what anyone may argue to the contrary. I took his words to heart and to this day in my business when I deal with people who have spirit or demonic attachments, and even three cases of possession, I have seen the face of evil. Believe me, it’s real. It exists and it is at work in our world. Wetiko focuses on the destruction of the afflicted individual, so they are lead down a path of self-destructive behavior that not only affects them, but also affects their loved ones. Slowly, the afflicted person’s life begins to disintegrate all around them until their life is a mere echo of their former life. Dispelling Wetiko is about becoming aware of Wetiko & using this awareness as a valuable tool and weapon in fighting and overcoming it. Knowledge in this case IS power. Through such knowledge we can overcome the grip that Wetiko has on our world and overcome it once and for all, but we all must join together in the fight and not allow us or individuals we know to become overcome by Wetiko and fall under its spell. Paul Levy, the author of Dispelling Wetiko, provides examples from his own experience and a thorough psychologically and spiritually sound discussion of Wetiko in terms of what it is, what it does to a person, its agenda, and how we can combat it, thus creating a much better world for ourselves in the process. A valuable book that will open many eyes, Dispelling Wetiko is definitely not only worth reading, but crucial to everyone’s spiritual well-being to do so. 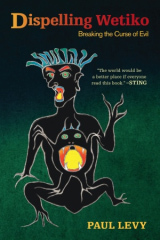 UPDATE: Thank you to Sally Nur who informed me there is also a Kindle edition of Dispelling Wetiko, which is available at: http://www.amazon.com/Dispelling-Wetiko-Breaking-Curse-ebook/dp/B008IU9I16/ref=sr_1_1?s=digital-text&ie=UTF8&qid=1373063402&sr=1-1&keywords=dispelling+wetiko.